11 December 1945: Three days after Lieutenant Colonel Henry E. Warden and Captain Glen W. Edwards set a transcontinental speed record flying a prototype Douglas XB-42 from Long Beach, California, to Washington, D.C., in 5 hours, 17 minutes, Colonel Clarence S. Irvine and the crew of the B-29 Pacusan Dreamboat also set a record, flying from Burbank, California to overhead Floyd Bennett Field, New York, in 5 hours, 27 minutes, 8 seconds. The average speed for the 2,464-mile flight was 450.38 miles per hour (724.82 kilometers per hour). 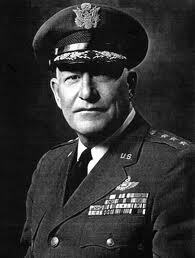 Irvine was Deputy Chief of Staff, Pacific Air Command, 1944–1947. He flew the Pacusan Dreamboat on several record-setting flights, including Guam to Washington, D.C., and Honolulu, Hawaii to Cairo, Egypt. He rose to the rank of lieutenant general in the United States Air Force, and served as Deputy Chief of Staff for Materiel. Pacusan Dreamboat was a Bell Aircraft Corporation B-29B-60-BA Superfortress, built at Marietta, Georgia. 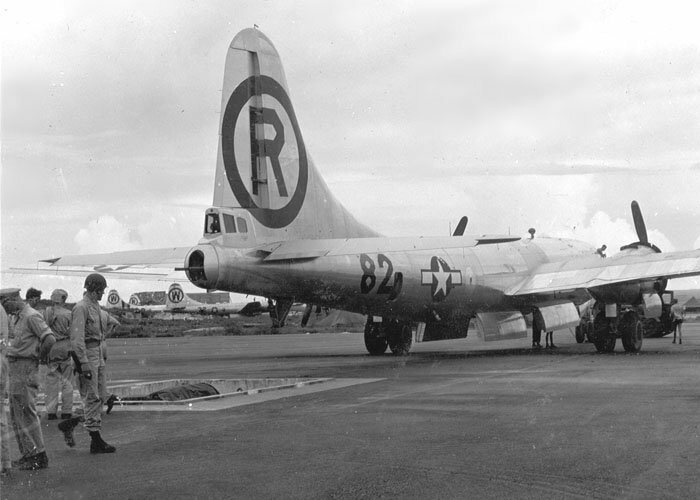 The B-29B was a lightweight variant of the B-29, intended for operation at lower altitudes. It did not have the four power gun turrets and their .50-caliber machine guns. A radar-directed 20 mm cannon and two .50-caliber machine guns in the tail were the only defensive weapons. Much of the standard armor plate was also deleted. Pacusan Dreamboat was further lightened. The tail guns were removed and the tail reshaped. 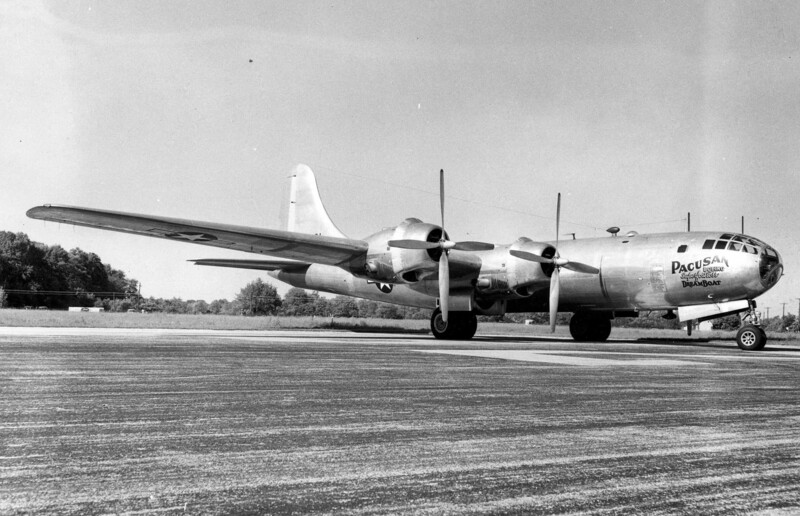 The B-29B was equipped with four air-cooled, fuel-injected Wright R-3350-CA-2 Duplex Cyclone two-row 18 cylinder radial engines and specially-designed propellers. The engine nacelles were modified for improved cooling. 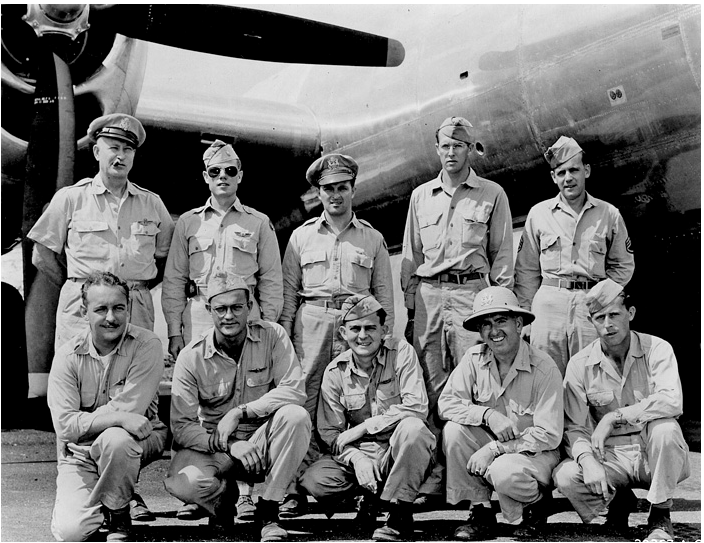 The Superfortress had been lightened to an empty weight of 66,000 pounds (29,937 kilograms). A standard B-29B weighed 69,000 pounds (31,298 kilograms) empty and 137,000 pounds (62,142 kilograms) fully loaded. Additional fuel tanks installed on the Dreamboat were able to carry 10,000 gallons (37,854 liters) of gasoline. —The Making of the Atomic Bomb, by Richard Rhodes, Simon and Schuster, New York, 1986, Chapter 19 at Page 739. 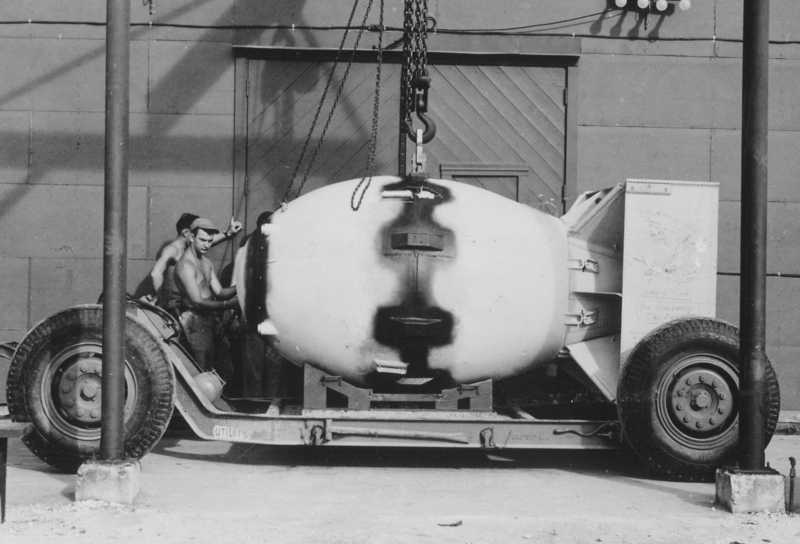 Fat Man was an implosion-type fission bomb, using plutonium (Pu-239) as the nuclear material. It was a very complex device which used 32 precisely-shaped explosive charges surrounding the spherical plutonium-alloy core, detonating with enough force to compress the core to double its normal density. This caused it to reach “critical mass” and the fission chain reaction began. 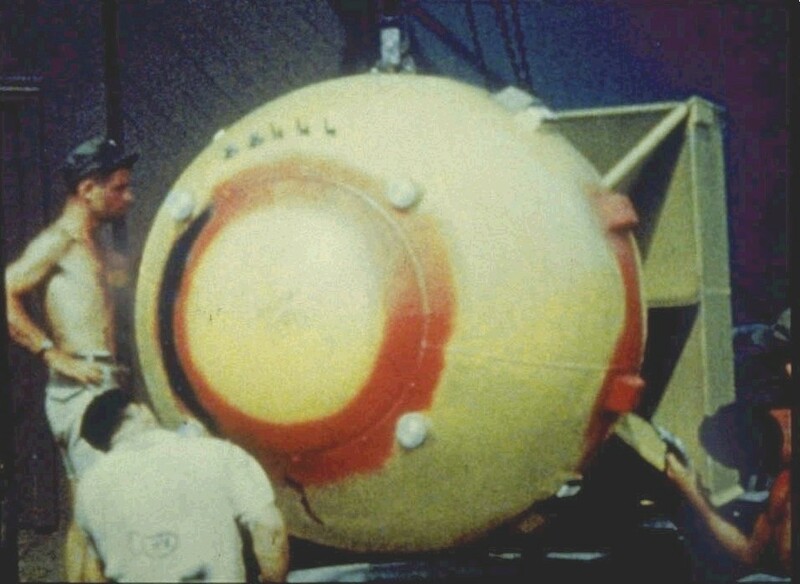 The Mark III bomb, unlike the gun-type “Little Boy,” required testing before combat use. 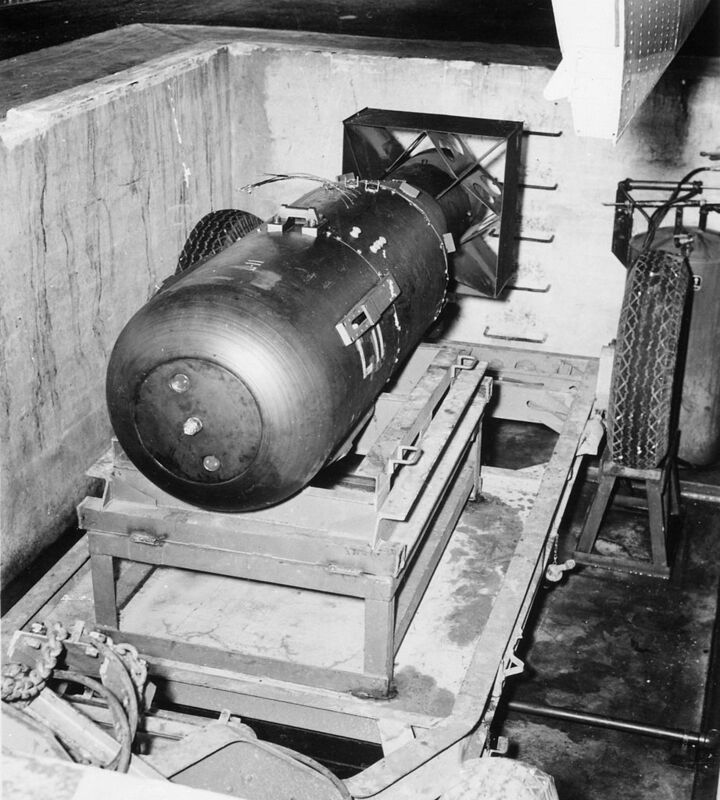 The nuclear component of the bomb, called “Gadget,” had been exploded at 05:29:45 a.m., Mountain War Time, 16 July 1945, at the Trinity Site of the Alamogordo Test Range, in the Jornada del Muerta desert of New Mexico. The explosive yield of the detonation was estimated to be equivalent to 20–22,000 tons of TNT. The fully assembled combat weapon was 12 feet, 8⅜ inches ¹ (3.261 meters) long, 5 feet, ¼ inch ² (1.530 meters) in diameter, and weighed approximately 10,300 pounds (4,672 kilograms). 5 August 1945: In the afternoon, the Glenn L. Martin Company B-29-45-MO Superfortress 44-86292 was towed into position over a 13-foot × 16-foot (3.9 × 4.9 meters) concrete pit on the island of Tinian in the Marshall Group. 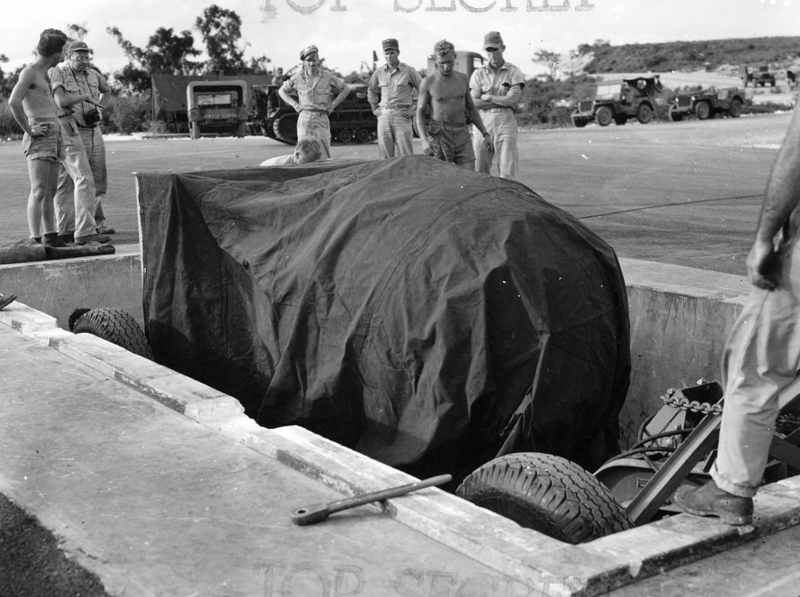 Down in that pit was the most destructive weapon of war yet devised by man: The Mark I, code named Little Boy. Little Boy was a nuclear bomb, designed to explode with unimaginable force when two masses of highly enriched uranium were forced together at very high speed. This was a “gun-type” bomb, considered to be so simple that it was not even tested before it was used. 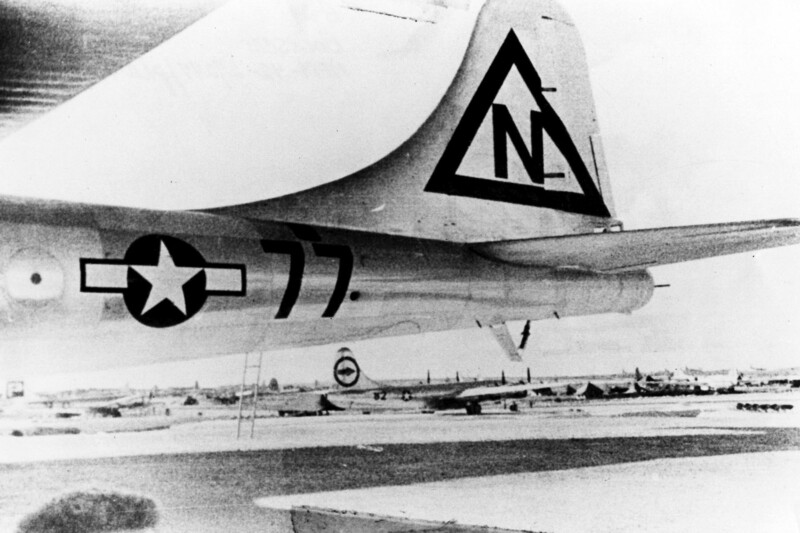 Several hours later, at 0245 6 August 1945, the B-29, which had been named Enola Gay, took off from North Field and headed toward Hiroshima, Japan.